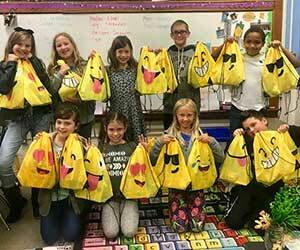 Thanks to a grant funded by the Gahanna-Jefferson Education Foundation (GJEF), Jefferson Elementary has found a way to ease the transition of new students entering their school mid-year. The fourth and fifth grade "Lighthouse Team" provides L.I.N.K. Kits (Let's Include New Kids) to each new student entering the school. The student Lighthouse Team is in charge of stuffing the kits with new markers, crayons, glue sticks, and pencils. When students move mid-year they often come with no supplies so this will help them start off with what they need on their very first day at Jefferson. The Lighthouse Team also adds personalized notes welcoming the student to Jefferson. They deliver the kit to the student on their first day and will give the student a tour of the building and answer any questions they may have.